(March 30, 2017) Wake Foot Sanctuary, the wildly successful foot soaking spa in Asheville, North Carolina, announces plans to expand its successful brand by offering franchise opportunities for the first time. The company, demonstrating 50% year-over-year growth since opening its one location, is one of the few foot-soaking spas in the U.S. and the first to franchise. It’s a unique, enticing offering in the $16.3 billion-dollar-a-year U.S. spa services industry which continues to grow at an explosive rate. The company, with more than $597,000 in annual sales in its one location and industry leading sales-per-square-foot performance, demonstrates a strong financial foundation. Wake Foot Sanctuary falls within a new emerging category in the spa space offering upscale, one hour spa services as a quicker alternative to traditional full day spas. 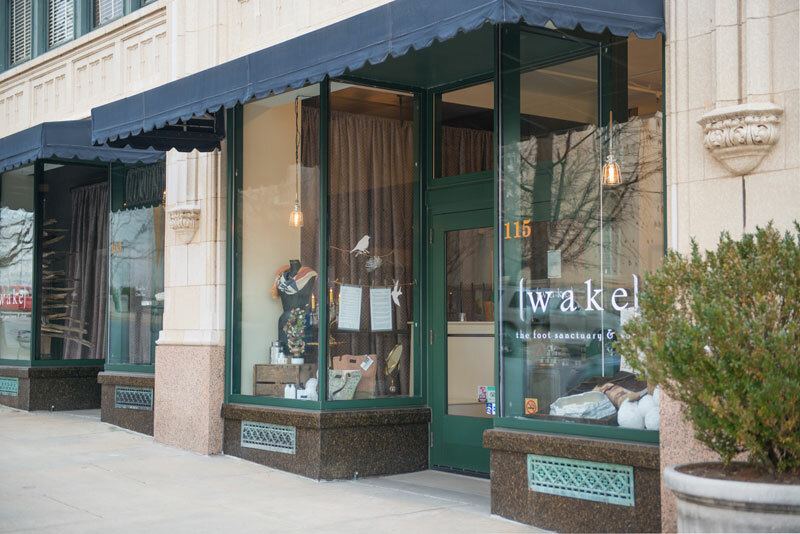 Wake offers customers luxurious, warm foot soaks with proprietary formulations, private label apothecary products, & uniquely procured goods for retail purchase. Customers have the option of a simultaneous massage of the feet and lower legs, hand and lower arm, or head, neck and shoulders. The spa also sells artisan crafted jewelry, natural hand-poured candles, handmade lavender and flaxseed neck wraps, and sensuous body care products. The company’s success is framed by powerful operational and marketing methodologies, soothing, white glove spa services delivered by passionate and empowered employees and a “cult” following of repeat visitors seeking a “no judgement” escape from a stress-filled world. The founders are Melissa and Brian Long, a married couple in Asheville with a passion to serve others. Now they’re ready to share their secrets of success with people who share a hands-on passion to do well by serving their local communities. Don’t let the mushy stuff fool you. Behind this sincere kumbaya vibe is a determined couple with shrewd entrepreneurial minds looking for aggressive business partners who want to scale a thriving business. Wake Foot Sanctuary opened its doors in 2013. Melissa was a disenchanted corporate sales and marketing executive on the fast track with a large consumer products company. Brian comes from a family of serial entrepreneurs and before starting Wake Foot Sanctuary, was a custom home builder. The Longs opened the spa in a shopping district of Asheville and it grew faster than they could keep up with. They often turn down customers because the schedule is jam packed. The Longs came up with the name after their beloved dog named “Wake.” They named him “Wake” because, one morning, like a long-lost friend, he appeared next to Brian’s car. (The name Wake signifies finding him in the morning). He, like many dogs, treated people with the utmost kindness and respect. Wake has since died, but his kind, selfless spirit lives on every day in the spa’s red-carpet treatment of all customers. The Spa services industry in the U.S. includes about 21,000 facilities with combined annual revenue of $16.3 billion, according to the International SPA Association. 7 out of 10 spas are classified as day spas. Day spas account for more than half of industry revenue and are growing at 25% per year. Average rate for a spa treatment at luxury hotel spas in the U.S. is $137. The spa industry registers 155.8 million visits every year with a steady triple figure annual growth predicted within the next 10 years. The spa industry is growing at an incredible rate. The astonishing growth is attributed to the demand for the “stress-free” environment, a place where people can escape the frantic, daily grind.